Carnegie Mellon professor Randy Pausch's diagnosis of pancreatic cancer was, for all intents and purposes, a death sentence. 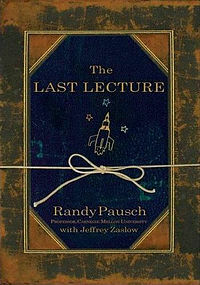 Carnegie Mellon tasked Randy Pausch with the honor of being the speaker during their "Last Lecture" series shortly after his diagnosis and instead of being morose about his prognosis, he decided to call it "Achieving Your Childhood Dreams." The Youtube video of The Last Lecture is worth the time (1 hr 16 minutes) to watch, as is the book worth the time to read. I don't want to spoil the video or the book for anyone, but I want to introduce what Randy Pausch calls the "head fake." The example he gives is when a kid learns to play football, he not only learns the game, but the deeper lessons of camaraderie, sportsmanship, dedication, rule following, etc. They are life's little lessons in disguise. I bill #GoTheDist as a challenge that logs effort and consistency (% completion) instead of results (inches/lbs). While this is true, there is also a few head fakes working as well. 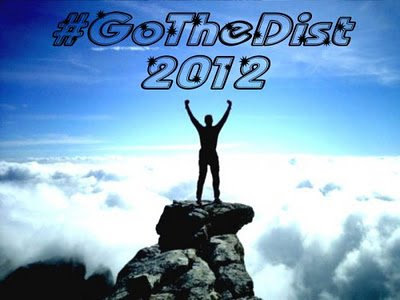 #GoTheDist is about deciding to go on an epic journey in the first place. In the end it isnt about the miles logged, minutes spent exercising, sweat expended, or sore muscles. It isn't about whether you are at 100% of your goal or even 80%. It is really about the choice you made on the day you made your pledge to see yourself as someone who strives, as someone worthy of a goal. Each day you are able to put down a number (or even the intentional rest days) is a day you reaffirm this pledge to yourself -- that you are capable of becoming and living as the person you see yourself to be. It is my greatest hope that on December 31, 2012, we will all be able to thank the person that on January 1 said "I will #GoTheDist" and believed it was possible. You're amazing. I love this. I love what you've created. best blog post in ages I've read. So encouraging! I hadn't heard about the #gothedist head fake, but am encouraged to go the distance!